Organic, fair trade, caffeine-free, premium grade high mountain Jiaogulan (Gynostemma Pentaphyllum) loose leaf tea pack – 100g (3.5oz). You get pure Jiaogulan tea just as Mother Nature intended it – nothing more, nothing less. 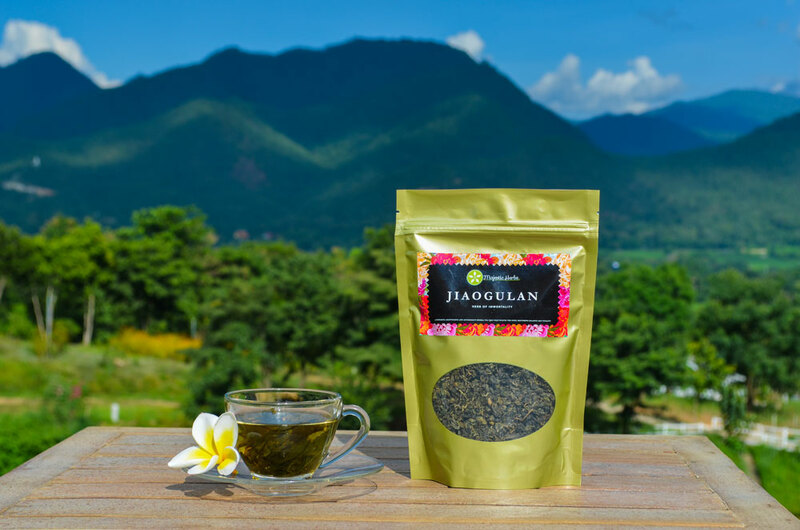 Sit down, relax, and enjoy a cup of delicious Jiaogulan tea! One pack provides 3-4 weeks supply of Jiaogulan for 1 person, depending on dosage. I’m a 71 years old woman and I started drinking jiaogulan 3 months ago. I don’t have any health conditions, so I’m very lucky in that regard for my age, but started taking Jiaogulan for prevention and maybe to get more energy during the day, as I still do some work as a jeweler for different stores around town. After the first few weeks I noticed feeling perkier and less tired. Last week I had a few big orders that I had to work on over several days, which happens from time to time but not too often. Usually I’d feel tired after working for half a day or a day, and I’d need to take a break or take the rest of the day off. So I was quite surprised this time around because I was able to do all my work in 3 days practically without much of a break, and I did not feel tired and was even energized! I don’t know if it’s the tea or if it’s just a placebo effect, but I definitely felt a big difference! I’ve been taking Jiaogulan for six weeks now and really started feeling the effects about three weeks ago. I feel that I have more energy and deal better with stress but it’s not just that. For the first time in many years I simply feel like doing things. Trying new experiences, getting in touch with family and friends, completing half-completed projects. Preparing Jiaogulan tea has already become something of a ritual; once the pot is ready I sit down and with renewed resolve I write that email, make that call, finish that proposal. As a mother of a very active 4 years old boy I was looking for something that can increase my energy levels and reduce my stress and anxiety at the same time.. I started drinking Jiaogulan 4 weeks ago and noticed the effects about 2 weeks ago . I was skeptical at first, but after the first cup I knew I would be reordering.. The flavour is fantastic, pure and so intense ..
Now I have the energy boost I wanted and feel like I can do even more things ..and it does soothe me on a busy day.. It has also relieved me of any bloating that I have been having.. I love it and would highly recommend ! flavor is a little weird (grass and trees lol), but not bad. I did end up adding stevia to finish it. As I tried the product for my first time I found it’s very good to help my family to try it. Tasty tea if the directions are followed! Sweet, bitter edge, smoothly green-tasting, rich terroir – really! Refreshing chilled with lime juice and thinned with a bit of water for a satisfying “lemonade”. Also restorative as a hot beverage in cool weather. I find it doesn’t need sweetening at all. I had real bad back spasms due in part to the high blood pressure medication that I was taking. The doctor changed it to a different type of HBP medication and at the same time I started taking this tea along with magnesium supplements to help get rid of the back spasms. After about two weeks the back spasms were gone completely and I felt like I was 21 years old again (am past 60 y/y), I had not felt this good in a long time. I thought that the magnesium supplements were the ones responsible for getting rid of the back spasms so I stopped drinking the tea. A month later the back spasms came back. I went to the doctor again who sent me to the physical therapist and that helped a bit, but I started drinking the tea again and stopped taking the magnesium supplements because I don’t want to be in pain again and to help me with the high blood pressure. It’s been 6 weeks now that I have been drinking the tea in the mornings instead of coffee with sugar and milk. I am so happy I started drinking this tea, I feel great, full of energy and strength, no more joint pain or body aches and best of all I have lost 12 lbs. I have not done any exercise (which I should) or followed any diet to be loosing this much weight. Most of the weigh has come off from my waist area. I was physically bloated and felt it every day, but this tea has gotten rid of the bloating in my belly. I love this tea and will continue to drink it for the rest of my life. My blood pressure has gotten better and I have cut down on the dosage that I take. Thank you for bringing awareness to all of us about this majestic herb, it really is majestic. Love it! Wonderful morning and afternoon tea. This tea has a light, natural sweetness to it that makes it wonderful to drink as is….nothing added. I was surprised when the dried tea unfurled in my glass mug. The leaves were whole and some still on their little vine. Quite beautiful they are. It helps me sleep at night. It is quite tasty. I love this product and Majestic Herbs has been a terrific supplier. Their customer service follow-up is phenomenal. As an avid coffee drinker, I was surprised by complex flavor and subtle but sustained increase in energy I felt throughout the day. This is the only tea I will drink. Btw, I brew the tea&store it cold& drink it instead of water. Reputation pumped expectations. With a little research on the Web, I learned this company offers a superior product. This is an interesting herb, bright-sweet and somewhat bitter at once, and highly refreshing in our altitude’s intense sun. Seems to have strengthened digestion already, and it’s only been a week. Wild. I do not know if the health benefits are proven, but it is a real good tasting, relaxing tea. This tea is not as sorted as other Jiaogulan Teas I have bought in the past however it taste just as good and at about a third of the price I will only be buying this brand. It is still organic and has 100g compared to about 30g in most other packages for around the same price. I have been drinking this type of tea everyday for a few months now and I must say I feel great. I have stopped drinking coffee all together and only drink this. Funny thing is I have just as much energy and there is no caffeine in this tea. Its more of a constant fresh energy not jittery like I get if I drink too much coffee. I wish to confirm your tea tastes great. My wife and myself are having a very good time with it. For just two weeks, I have lost 3 kg, from 88kg end Oct to 85kg as at this morning. The usual dreariness which comes over me in the office in the early afternoon which makes me lock my office and doze off for about 30 mins has already become history. Pains in the knee whilst climbing stairs is also fading away and many more which I will take time to chronicle for you later. Wonderful tea! I love the flavor and have been drinking it every day. It arrived promptly and was packaged nicely though in plastic like everything now days so I decanted it into a glass mason jar. I was pleased to find this Jiaogulan tea to be every bit as good and fresh as that purchased by a competitor who charged more for the tea. Theirs had an expensive packaging, but that added to the cost. I like the way this company’s tea was vacuum sealed in a heavy-weight, resealable bag. The quality of the tea seems identical to the other brand. Good communication from the company. 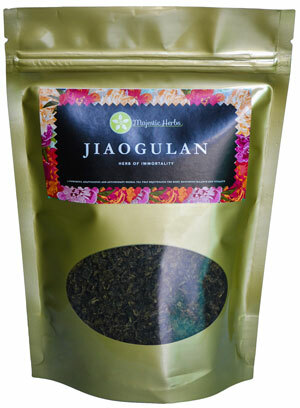 I read that Jiaogulan tea has health benefits and is also non-caffeinated. So I tried this tea and I found out that I like it. It’s not bitter unlike some teas that I’ve tried. It’s sweet and I don’t even have to add honey or other sweetener. Loose tea is much better that the tea bags, and I also ordered a tea pot for this purpose. I would give this 5 stars, but this tea has more stems in the bag than previous brands I have tried. I like the heavy-weight, resealable bag it comes in. This tea seems to be of same quality as more expensive brands. It does not get bitter if I steep it too long, and is very smooth. I got very good service. I like to brew it with some spearmint and green tea for a nice flavor. I will be purchasing this brand again from Majestic Herbs. The tea is delicious. I have found that steeping the tea for about 4 to 5 minutes produces the best taste, slightly sweet. The tea has a bitter taste if steeped to long. I have only recently started drinking the tea and have not seen any health benefits yet. Tasty tea!!!!!! If you are accustomed to medicinal or herbal teas this is great . I can’t say that I feel any different as of yet but it is definitely something that I love having for breakfast. My only recommendation with this product is that you don’t add sugar. I find it gives this tea a horrible taste and by sugar I mean agave nectar, white refined sugar, monk fruit sugar, stevia ,cane syrup, and honey. 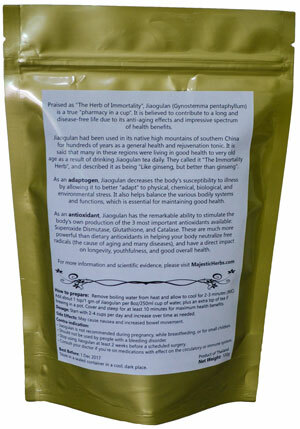 I have been drinking Gynostemma tea for a few weeks now. I love the flavor and I am also noticing that I am much more relaxed and my cravings for sugar have greatly diminished. This is the Holy Grail of tea. It takes away sugar cravings and produces an overall feeling of well being. An energy maker and tastes delicious. I’m delighted with the purchase. Quite an interesting product. I noticed a general “uplift” effect, mild and gentle but noticeable. It does not adversely affect sleep, although I haven’t made any as an evening beverage. The taste is OK, easily drinkable.but not something you’d drink primarily for flavor. Overall I’d say this is a very good addition to my supplement program. Better than that? Time will tell. Great fresh herb. It tasted fresh and had a deep rich flavor. Will definitely buy again. Thanks. I’m used to strong tasting herbs, but I think this is strong tasting – I have a chaser instead of adding a lot of sweetener. Tast good and i evan orderd 2 more bags. My coworker turned me on to this tea and i got to say life is good it evan mixs good with the hibiscus flower. Delivery was on time and tea is great. It gives you an uplifting feeling. On day 3 I felt like a new person. Antioxidant wonder! This is delicious and beautiful tea. It’s loaded with good things and provides energy plus endurance. Will buy more when needed! Love this tea and have been drinking for several weeks. It has amazing healing properties and I feel great. It’s nasty it’s kind of strong but it does make you feel better I would put milk to lower the flavor. Feel good after take this tea 01 week after I got It .I love it will buy again. I have been drinking this tea for about 1 week. The only thing that I have noticed so far is that I sleep very soundly which is really nice. The flavor is odd. Kind of like a smokey taste. I like the tea and will continue to use it. Customer service is excellent. Tasty energy. Delicious tea. Tastes very good and easy to make.